Your career is much more than just your job – or it should be. It’s more than just how you make a living at any point in time. It’s a way of life. What we do for a living is within a much larger energy flow and every part of that flow is important. For example, when we work, we provide something that is of benefit to someone or something else. For that benefit we provide, we receive compensation. In this day and age, that compensation typically comes in the form of money. We use that money to pay for benefits that others provide us (gas for our cars, food for our tables, dental services) so we have another layer of compensation for someone else’s work. And so it goes in a chain of giving and receiving. When this chain is broken or misused, something will have to give somewhere down the line. If I am producing goods or offering services that are of no benefit to others, I don’t get compensated. If I pay my utility company but the company refuses to provide electricity to my home, believe me, that chain is going to get upset by an army of my attorneys! In flourishing in our careers, that energy exchange needs to keep moving and stay in balance. The work you do must give a good benefit to another and what you receive must be fair compensation. 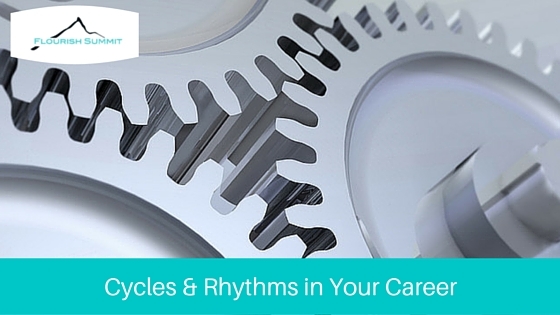 Another aspect of cycles and rhythms in career is that each career and each industry has ebbs and flows. Skyrocketing to the top is often a false high. Each step of the ladder or expansion along the way is not just a part of the cycle to put up with until you get promoted or your business moves to the next level. Each stage has its wisdom and learning to impart. The principle of cycles and rhythms tells us to keep our eyes open, learn from, and appreciate every moment of the journey. Especially in today’s economy, the only thing that is certain is change. When we fight the change of cycles, we tend to shoot ourselves in the foot. But if we take a deep breath and keep calm, we can ride each cycle’s wave easily. If you really follow your passion and honor your values, the emotional ups and downs that come with any lifelong pursuit will seem minor and totally manageable. Are You an Unconventional Thinker?